cause a multitude of effects in the lives of children and teenagers. 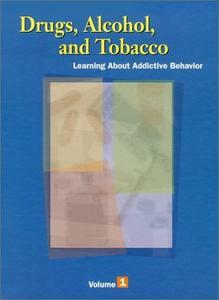 Drawing on the previously published Encyclopedia of Drugs, Alcohol, and Addictive Behavior , this set is designed to interest and educate students in middle school and older as well as general browsers. This work contains more than 200 alphabetically arranged articles addressing the nature of, treatments for, and social issues surrounding addictive substances and behaviors. Articles from the previously published set have been revised to suit the needs of younger readers, their teachers and parents, and nonspecialists. Articles range in length from several paragraphs to several pages and introduce such topics as Anabolic steroids, Binge drinking, Creativity and drugs, Ecstasy, Gambling, Gangs and drugs, Treatment types, and Risk factors for substance abuse. Articles are clear and well written, and the appealing layout includes photographs, diagrams, and sidebars that mention interesting facts or suggest fiction titles that deal with similar issues. For example, Cut, by Patricia McCormick , is suggested for the article Cutting and self-harm. Words highlighted in the text are defined in page margins . See also references conclude each article. Each volume begins with a complete table of contents and concludes with a comprehensive glossary, annotated bibliography (including Web sites), and index (volume 3 contains a cumulative index). A listing of organizations (including addresses, phone numbers, and Web sites) to contact for further information or assistance is also provided. We came across one error: the article Alcohol: Withdrawal states that the process of detoxification "usually takes fifteen to twenty years." Containing sufficient information to serve the needs of a variety of student users, this set will appeal to the casual browser as well. It is recommended for junior- and senior-high-school and public libraries. It is broader in scope than , which has entries for 50 drugs but not for other, related topics.